Okay, enough namby pamby oracle cards for a few days. I’m just teasing, I love oracle cards, and I find they are healing and grounding when nothing else is. But Mars is in Scorpio, so let’s show some fighting spirit with a duel spread from the Samurai Tarot. The duel spread, you may remember, includes one card representing the querent (in this case, all of us) and one card representing the opponent (in this case, a challenge for the day). The face off this time is between the reversed Sun and the reversed Nine of Wands. While the reversed Sun can indicate a temporary depression, I don’t see it that way today–I see it as our joy in the present moment being blocked because we are so intensely focused on something other than the present. It could be a matter of concentrating on work so hard that even time and place is blocked out. Sometimes we need that type of concentration and it’s welcome. Maybe this is one of those days. But all days have their difficulties, and often we resist those. 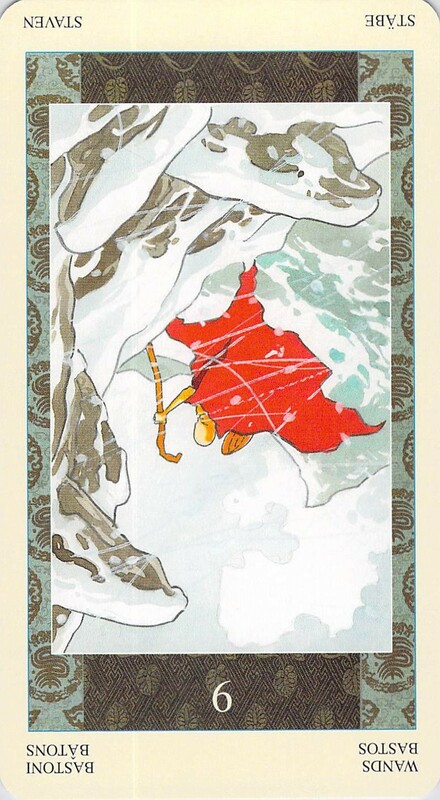 A voice inside us shouts, “No!” But the Samurai Tarot’s Nine of Wands card shows us the monk Nichiren, who (according to Wikipedia), after he was supposed to be executed but the execution was stopped because a bright orb appeared on the execution grounds, was sent into exile on a bitterly cold island, Sado. We can see him on the card struggling through the snow. 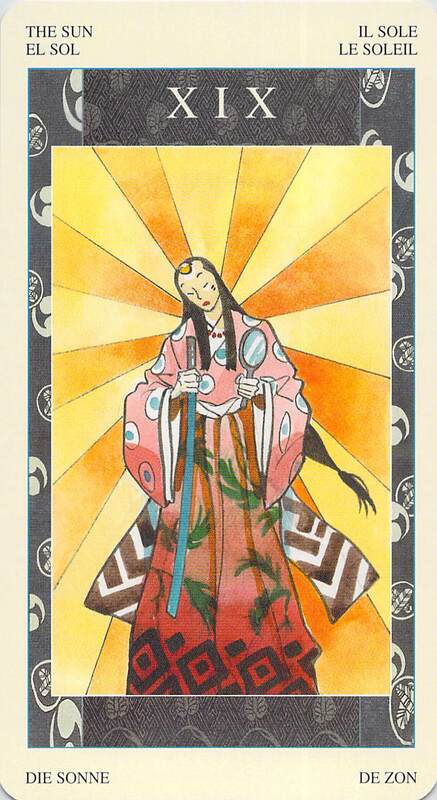 (As an aside, Nichiren’s birth name, Zennichimaro, is supposed to mean “Splendid Sun” or “Virtuous Sun Boy” — so pulling this card with the Sun card is like pulling two Suns, in a sense.) Why is this card reversed? 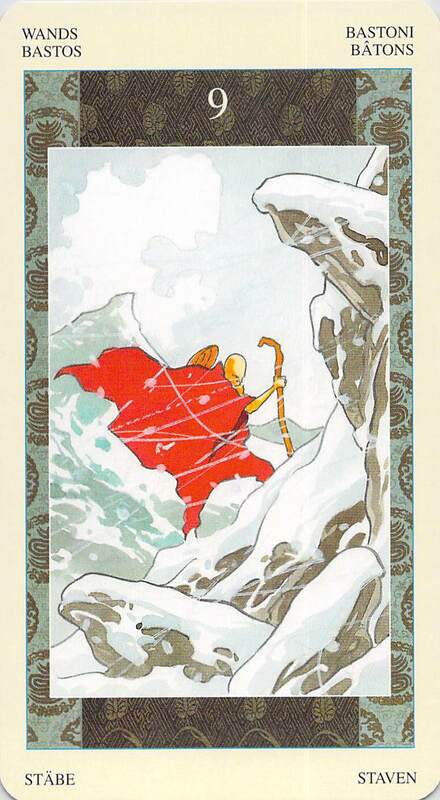 This is a situation similar to the card that showed meditation under a freezing waterfall. It seems that we are not embracing our difficulties today — and we need to. Embrace the difficulties of this present moment fiercely and tenderly, as if you craved them. Then, they will lose their power to torment you. This is the only way we can win this particular battle. Swearing at the snow won’t help. Neither will slashing the wind with a sword or staff. We can only revel in the cold. Previous Cards for the Day: Compassion Plus Creativity: Just for today, don’t judge, just create!